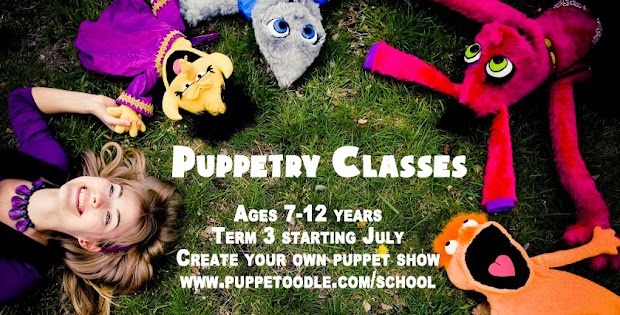 Upcoming term of puppet classes! After two very successful terms, my Tuesday classes at Tuner School will continue on with a whole stack of new puppets, activities and fun. If you know a Turner student between the ages of 7 and 12, make sure you tell them about my 9-week puppetry course, made especially for them! After an amazing teaching residency last year (visit blog for details) – I’m back at the wonderful Belconnen Arts Centre! If you know a budding young creative who would like to create their very own puppet show – make sure you send them this link! Across the 9 week program, you’ll learn skills to design, write, create and build your very own puppets and show as well as learn how to operate a variety of professional puppets. All materials to create your puppet show are provided. I’ll be presenting two FREE “Puppet Mania” programs at the Belconnen Library during this upcoming July School Holidays! Click on session times to reserve your spot! Hurry, places won’t last long! Jonathan and I will be performing our latest show at the very special 50th birthday celebration (Great Big Adventure Festival) at the National Museum of Australia! We’ll be performing our show twice during the day on the big stage! There will be lots of other activities during the FREE event, such as craft, dress-ups, tea parties, toys and a special story time with Play School presenters Teo and Emma. The day’s program repeats 10am to noon and noon to 2pm. We’re only halfway through 2016 and it’s been an exciting year already! I’d like to take a moment to thank all my clients, students, parents and supporters who’ve made the past 6 months so magical. Along with working at schools, childcare centres and events all over Canberra, I’ve also had the opportunity to work on some bigger projects – here are some of the highlight! In March, I custom-made a special black-light (UV light) puppet for the Australian National Botanic Gardens. Across two weekends, Luma danced through big crowds throughout the ANBG’s spectacular evening lighting displays and activities. I also facilitated a special shadow puppetry workshop using found objects from the gardens, which saw many kids, families and adults playing, learning and creating beautiful shadow shows. Over the Easter long weekend, Jonathan and I had a fantastic time performing at this year’s National Folk Festival, every day, across four days at the Carnival Stage. We were blown away by the huge audiences spilling out to the main street, and were especially touched by the kids that came back for every show, each day! During the April school holidays, Jonathan and I performed a special show at the National Archives of Australia. A show themed around inspiring audiences to use simple and house hold items around them to create, imagine and play. The show was specially commissioned by the NAA and was a wonderful success. In May, I was a guest speaker at a wonderful storytelling event for Canberra teachers at the National Library of Australia, hosted by ALEA (Australian Literacy Educators’ Association). In my presentation, I spoke of my experiences running my business, the fundamentals of puppetry, my research and findings in the benefits of using puppetry in education, therapy and as as a medium for storytelling. During my presentation, I provided fun and simple activities, demonstrating how puppetry can be an excellent non-threatening, fun, relatable and easy to use teaching tool for all sorts of things. QUOTE “PUPJUNE” for a 10% discount! Have a birthday party coming up? Are hosting an event and want to attract some more attention? Do you work at a childcare centre or school and need a fun activity to help teach a new topic? Or perhaps have a creative afternoon with some friends? From now until December 31st, 2016 – you can get 10% off your next event booking. Just quote “PUPJUNE” or mention this e-bulletin when you send me an inquiry. For details, pricing info and bookings on puppet shows, workshops and custom puppets, please send an email to marianne@puppetoodle.com. For everything else, head to the blog!